When Virginia-based ecologist Jeff Atkins visited the giant redwood trees at Muir Woods National Monument, he saw something that blew his mind. "I remember watching drops of water falling from the top of the canopy," he wrote on Twitter. "And it took forever for them to fall. I mean FOREVER!" Redwood trees are so tall that, standing on the forest floor, you can't see to the tops. “You crane your head back and you look up, up, up, up, and it becomes a blur as you get into the crown," says Lucy Kerhoulas, professor of forest physiology at Humboldt State University. You can't really know what's up there, unless you actually go up and climb,” which Kerhoulas has. 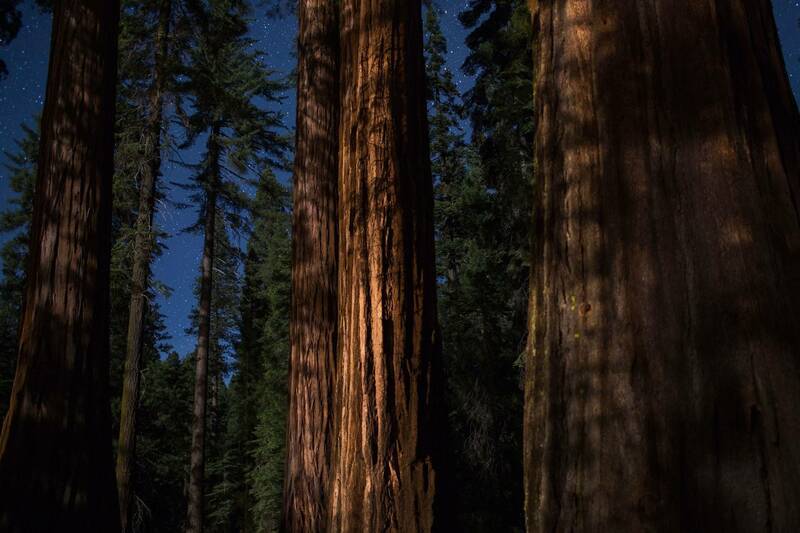 Summer in California is a great time to hang out with giants: the giant sequoias in Yosemite National Park, or the giant redwood trees in forests from Big Sur to the Oregon border. 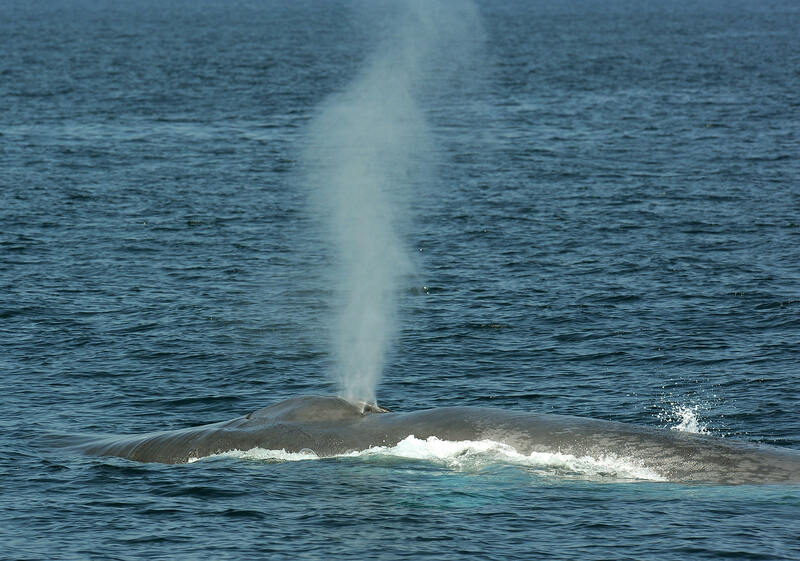 And though the famous grey whale migration season is long over, summer whale watchers can spot the world’s largest living animal: the blue whale. 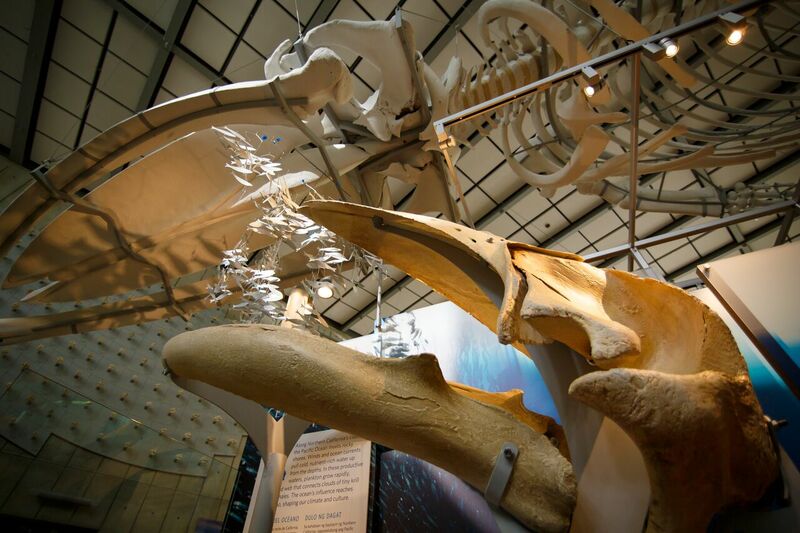 One of the best ways to learn about California's giants and why the state became home to these giants is by visiting a new exhibit at the California Academy of Sciences called Giants of Land and Sea. It isn’t happenstance that California and the waters off our coast are home to these giants. As the new exhibit explains, bigness emerges partly from the particulars of life here – the ocean currents and our famous fog. A blue whale skeleton, 85 feet long. An immersive fog room, where visitors can feel what it’s like to be a redwood. A series of films featuring the ecology of a redwood tree from roots to crown, shot by a drone in 6K definition. Skulls and skeletons of marine mammals, including the massive northern elephant seal. Strong winds drive ocean upwelling along the coast, bringing nutrients up from lower layers of the ocean to the surface. Plankton and krill multiply exhuberantly, providing food for the blue whale. Those same winds bring cold water south from Arctic latitudes. When warm summer temperatures hit that cold water, a fog layer forms. The fog is drawn toward land, providing plenty of water for the redwood trees along the coast. Redwoods evolved the ability to tap into fog, absorbing some of its moisture through their leaves and funneling more to their roots. So ocean currents and weather systems unite in an ecological system primed to foster bigness in California. Still, UC Davis paleontologist Geerat Vermeij says ecology doesn’t tell the whole story of how the giants got so big. Plants and animals don’t evolve bigness just because they can, much like a car doesn’t move forward just because there is a road in front of it — someone has to get in the driver’s seat and turn it on. In other words, there needs to be an evolutionary driver, too. There has to be an advantage to being bigger. Will Gearty, a paleobiologist at Stanford, thinks he knows what pushed many marine mammals to get big: they needed to keep warm. Water pulls heat from a body much faster than air — it’s why you can get hypothermia in 60 degree water. A marine mammal needs to deal with this every day, and one of the best ways to prevent heat loss is to get bigger. “The amount of skin they have compared to how much stuff inside they have goes down,” Gearty says, "and so they lose less heat." Gearty calculated the optimal size a mammal would need to be in order to stay warm in the water, and it turns out that’s about the size of a manatee. Relative to most land mammals, that's pretty big, and it’s comparable to many marine mammals we do see. But it’s a whole lot smaller than a blue whale. Research published last year suggested it was food density, not food availability, that drove the evolution of the biggest whales. Bigger whales were more efficient consumers of dense pockets of krill than smaller whales. But Vermeij favors a different hypothesis: killer whales and giant sharks. “It turns out that the evolution of the very largest whales pretty closely coincides with the evolution of killer whales,” he says. Killer whales aren’t all that big, but they are social hunters, which allows them to bring down really large prey. Other early whales may have encountered Megalodon, a giant shark that stretched 59 feet from nose to tail. Being bigger than the Megalodon would have helped whales avoid becoming prey. It turns out that redwood trees evolved a second trait that, like their ability to absorb water from fog, allows them to thrive as huge trees: Redwoods are extraordinarily good at not dying. While some other towering tree species invest in growing very fast, redwoods invest in defense: pest-resistant heartwood, fire resistant bark, and an impressive ability to regrow damaged trunks and branches. 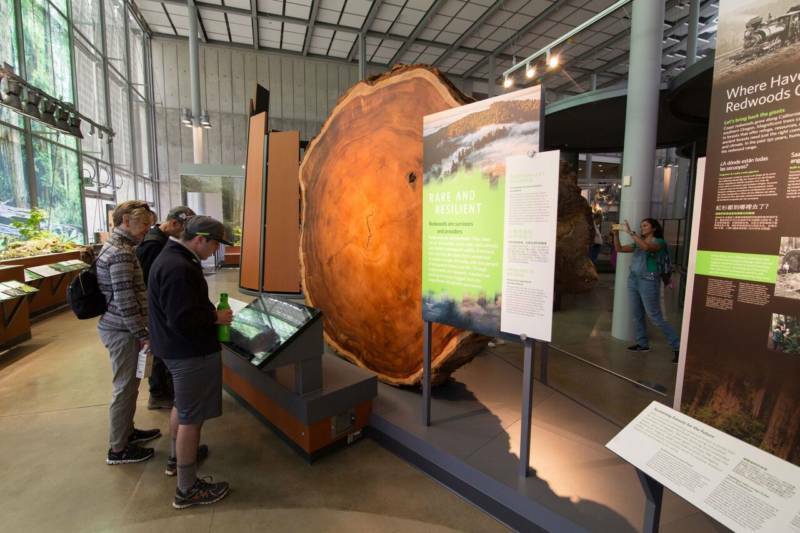 “It's incredibly difficult to kill a redwood,” says Tamara Schwarz, director of exhibit development at the CalAcademy. Over the hundreds or thousands of years that a redwood may live, even moderate growth adds up. The evolutionary driver of bigness in redwoods may be the advantage in being good at survival. Or it may be simply be that being taller means better access to sunlight in the dark forest. On the other hand, trees compete for sunlight in every forest, and the oldest trees on earth, the bristlecone pines, are not particularly big. Researchers don’t really know for sure what drives bigness in redwood trees. But an answer may lie in the redwood’s unusual, enormous genome, currently the topic of study for the Redwood Genome Project. The redwood genome is ten times the size of the human genome, with six copies of its chromosomes (both humans and giant sequoias only have two copies). Mapping the redwood genome may uncover genes that explain how the redwood got so big. Environmental conditions like fog and food availability might not have been the only factors in the evolution of giants, but if those conditions change, it might be enough threaten California's iconic species. Climate change could disrupt the ocean dynamics that generate abundant food and fog. Stanford's Gearty says the biggest concern for whales is that they will no longer have enough food to sustain their huge bodies. The future of redwoods may be bit less gloomy. Fog levels have declined over recent decades, but it’s unclear whether this will hurt the redwoods. 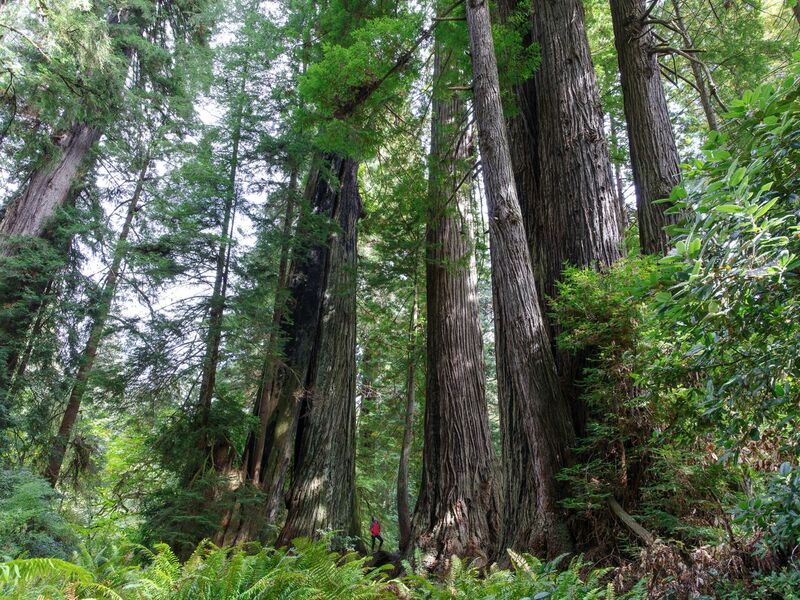 Some researchers say higher levels of carbon dioxide could help redwoods grow. When trees take in carbon dioxide, they lose water, but when there's a higher concentration of carbon dioxide in the atmosphere, trees can sequester more carbon for the same amount of water lost. “You get more bang for your buck,” says Humboldt State's Kerhoulas. And though drought and warmer temperatures might be stressful, especially for younger redwood forests, the same resilience that has allowed the redwoods and sequoias to grow so tall seems to be helping them cope with climate change. “It's not all totally doom and gloom,” Kerhoulas says. "These two ancient tree species, they have survived deep time, millions of years. And so from what I can tell, it seems like they are displaying a pretty high level of drought resistance and resilience."